The show aired a little something about the saga because we're apparently in 2011. There was nothing new obviously but there were bits of 2001/2002 interviews that I can't remember seeing before but I can't remember any video that old to be honest. I'm not sure if people outside of France can watch it and I unfortunately can't save it to show you so here's what Emma said (sort of. They .dubbed it so this is a mix of catching glimpses, lip-reading, and translating from French). From 2001: The more I auditioned, the more I wanted to get the part. 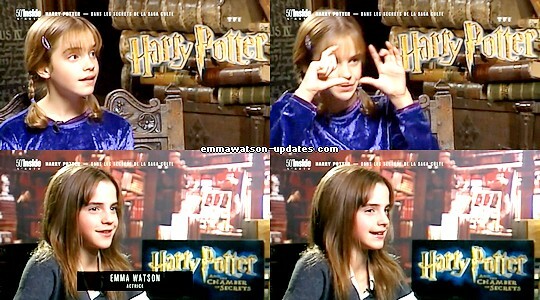 [...] Millions of girls wanted to play Hermione. [...] They have massive cameras! I thought it would be little cameras but these guys were four times bigger than me! From 2002: It's kind of weird because people know exactly who you are, they know your name and stuff. It's really scary, yeah.